When creating your perfect home office you should first consider the size of the space you have to work with. Begin to envision furniture and stylings that will positively influence you and enhance your productivity. Your office should represent your vision and be a reflection of your spirit. It should be inviting and warm without being distracting. Create a space that you can enjoy spending time in. When deciding on a colour scheme for your perfect home office, take into consideration the colour palette of the space and the rest of your home decor and furniture. You want to create a flow of colours throughout the home to provide continuity, while also choosing the right shades that will inspire peace, calmness and clarity in your place of work. Colours have such an enormous impact on us, psychologically, emotionally and sometimes even physically. Darker or vibrant colours can trigger stress or anxiety while lighter shades have the ability to calm and clear your mind. Its important to choose a fairly neutral palette to keep your mind focused while you work. Studies have found that pale greens paired with creams and whites will create harmonious feelings and thoughts whilst the inclusion of smooth light timbers and earthy colours will also promote a grounded warm environment. When selecting furniture for your office you need to think about more than just the way it looks. It needs to be practical whilst still appealing to the eye to help increase functionality of the office space and create a productive and effective working environment. When choosing a desk make sure that it fits both the room and your work style. Consider whether it gives you the right amount of storage for documents and supplies to allow for a tidy clutter free workspace. If you have extra room bringing in a small bookcase can also add style and extra storage to your home office. Sourcing the perfect chair is by far the most important thing on your list. You will spend most of your time here so you want something that is comfortable and supportive that provides good lumbar support and can be adjusted to your specific needs. A great way to celebrate your workspace can be to bring the outdoors in with some tasteful greenery. This can be such an easy and inexpensive way to bring your office to life. Plants allow you to breathe in cleaner air and are known to reduce stress levels. They have also been known to reduce noise and improve performance and productivity. By simply adding a touch of nature you can bring effortless beauty into your space and promote a calm and positive work environment. 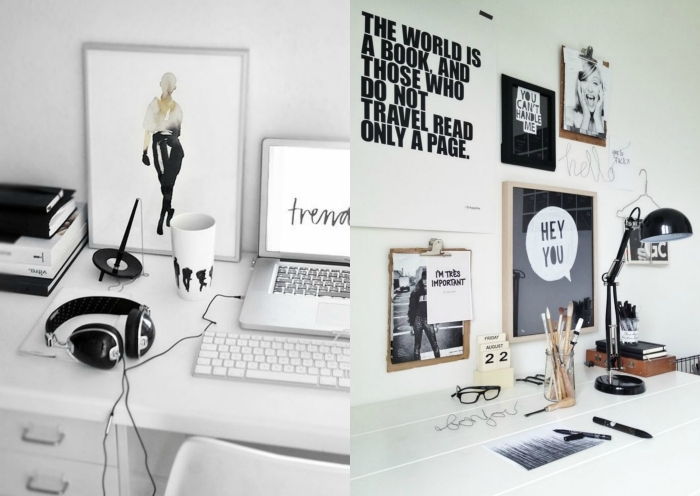 Working from home gives you complete control over the look and feel of your office so that it can reflect who you are and how you want to feel everyday. Happy people are productive people. Try jazzing up the space with items that remind you of all the other amazing things in your life like family or interests specific to you. Pin up your favourite photos and hang the perfect piece of art to offer feelings of joy and a little extra motivation for those distracted moments. The little personal touches will ultimately bring your home office together and complete your new favourite room in your home. There is no wrong way to design a space that it just for you so be sure to have fun and get inspired by what motivates you. Hopefully you have found these tips helpful to make creating your perfect home office a simple and enjoyable task. Now its up to you to sit down, keep the caffeine intake high and let the creative juices flow. We understand that a lot more people are working from home in this new digital age, so we wanted to offer versatile apartments that contain designated office or study spaces for the whole family. View all the The Anchorage Apartment Floor Plans here, so see how we have incorporated office spaces into our apartments. We have made creating your perfect home office space easy!